BILLINGS, Mont. -- Floyd "Creeky" Creekmore is one of the quieter acts in the circus, his larger-than-life clown shoes shuffling methodically as he works the crowd, igniting surprised giggles and slack-jawed wonder from children that look up to encounter Creekmore's wrinkled eyes smiling through thick makeup. At 95 years old, the former Montana rancher recently dubbed the oldest performing clown in the world has fewer magic tricks up his oversized sleeves than he once did. He gave up juggling several years ago after a stroke, and has long since parked the home-made bicycle he once incorporated into his acts. But when the Shrine Circus comes through Billings, where Creekmore lives with his 96-year-old wife, Betty, Creeky the Clown returns to life. At home in his kitchen, while Betty dozes in the living room, Creekmore pulls on a multi-colored, striped jacket and dons a bright orange wig topped by a yellow hat. He glues on a rubber nose, carefully ties his shoes. When his shaky right hand sends a line of make-up askew on one side of his face, Creekmore just makes the other side a little crooked, too. "I'll stay back from the crowd so they don't notice," he says. 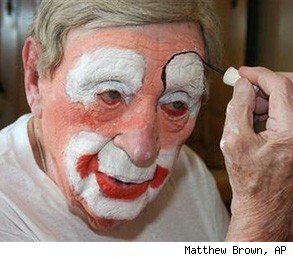 Others have laid claim to the title of world's oldest clown, including an 81-year-old member of the Moscow Circus, Oleg "The Sun Clown" Popov and Andy "Bumbo" Beyer of Santa Ana, Calif., who was widely publicized as the oldest until his retirement three years ago at the age of 91. But turns it out that Creekmore had a 20-month advantage all along, clowning away in his low-key style in eastern Montana. He now carries the imprimatur of Guinness World Records, which declared him world's oldest performing clown in February after friends applied on his behalf. Fellow performers and family members says Creekmore has started to slow down, yet gives no sign of ending his periodic performances. "Even if his body is telling him no, his mind won't stop," said grandson Tom McCraw. Back in his kitchen, Creeky is almost ready to go. He picks out a disappearing handkerchief and a gag-rope as props, offers a goodbye to Betty - "Doesn't he look good?" she remarks from the dining room table - and eases into his son's Volkswagen Beetle. A few minutes later he's mounting the steps into the crowded Shrine Auditorium. Just inside the entrance, he's approached by gaggles of glow-stick waving, popcorn-spilling children. Creeky shakes hands, tries out his rope trick, throws out grins. "Don't pinch the nose," he warns an over-eager boy sporting a Mohawk haircut. Creeky stays on his floppy feet through the flashing lights of the tiger tamer's act, endures the roar of a daredevil motorcycle act accompanied by hard-thumping rock and roll. When some jugglers take the stage Creeky ducks out to the lobby for a quick rest, then is back at his post in time to see a favorite performance, a dog act that includes a pair of long-jumping Afghans and a massive St. Bernard in a tight red dress. During intermission Creeky is competing for the crowd's attention with elephant rides and a 7-foot-tall Chuck E. Cheese. His voice barely audible amid the din, Creeky manages to spark laughter with each brief interaction. It's a routine Creekmore nailed down over eight decades, since his introduction to clowning in the 1930s. When the Barnum and Bailey Circus passed through the Montana city of Great Falls and other youths sought odd jobs in exchange for tickets to the show, Creekmore says he sought out the clowns, looking for insights. At 15, Creekmore had moved out of his family's house to work on a string of central Montana ranches while he put himself through high school. His interest in clowning was known in his hometown of Coffee Creek. So when he was invited to perform in a local parade he pulled together a costume from old clothes and lipstick - and found himself hooked on the laughter he drew. After retiring from a lifetime of ranch work and homebuilding in 1981, he joined the Shriners, a spinoff of the Freemasons that holds circus performances to raise money for the group's hospitals. He's since been a mainstay of the Shrine circus. A wall in his house is covered with awards from clowning competitions across the country. In Creekmore's family only grandson McCraw has followed in his footsteps. McCraw, 39, started clowning in 1982 at the invitation of his grandfather when he was 10 years old, after his older cousins balked at the offer. Creekmore and McCraw later would pair up to visit children in Shriners hospitals, the importance of which McCraw said became clear when he had a child with muscular dystrophy. "Creeky understands that to make a child laugh, to make a child smile, that's what life's about," McCraw said. As the performance at the Shrine auditorium nears an end, another clown escorts Creeky down a back stairway to avoid the exodus. When a woman holding a baby seeks his attention, Creeky slowly turns and heads back up the stairs to pose for one last photo. He's clearly starting to tire and, citing weariness, later cancels his planned performance the next day. But as he reaches the curb where his son will pick him up, Creeky smiles as he reflects on his decades as a clown. "It's been a real good ride," he says. "I get along alright so I might as well keep it up."